12th Australian Light Horse Regiment, AIF, 11th Reinforcements, embarked from Sydney, New South Wales on board HMAT A25 Anglo-Egyptian 19 September 1916. The HMAT A25 Anglo-Egyptian weighed 7,379 tons with an average cruise speed of 14 knots or 25.92 kmph. It was owned by the Nitrate Producers SS Co, London, and leased by the Commonwealth until 16 April 1917. 1915 Private Alfred Edward BERTEAU, a 24 year old Jackeroo from Isisford, Queensland. He enlisted on 1 February 1916; and at the conclusion of the war Returned to Australia, 10 July 1919. 1883 Acting Corporal Aubrey Allan BRITTON, a 21 year old Clerk from Nyngan, New South Wales. He enlisted on 13 March 1916; and at the conclusion of the war Returned to Australia, 14 January 1920. 1882 Private Charles BROWN, a 25 year old Labourer from Forest Lodge, New South Wales. He enlisted on 7 January 1916; and at the conclusion of the war Returned to Australia, 24 July 1919. 1884 Private George Keith CHURCHES, a 22 year old Student from Peel via Bathurst, New South Wales. He enlisted on 2 February 1916; and at the conclusion of the war Returned to Australia, 3 September 1919. 1885 Private Stanley Victor COOK, a 21 year old Farmer from Burwood, New South Wales. He enlisted on 8 February 1916; and subsequently Died of Disease, 25 October 1918. 1933 Private Victor Herbert DIGNAM, a 21 year old Labourer from Ogunbil, New South Wales. He enlisted on 10 May 1916; and at the conclusion of the war Returned to Australia, 24 July 1919. 1888 Private Edgar Bede DRIVER, a 41 year old Grazier from Mosman, New South Wales. He enlisted on 11 March 1916; and subsequently Returned to Australia, 11 July 1917. 1889 Private William James DUNBAR, a 35 year old Clergyman from Orange, New South Wales. He enlisted on 14 September 1915; and subsequently was Killed in Action, 7 November 1917. 1890 Private Percy Edward EVANS, a 19 year old Labourer from Annandale, New South Wales. He enlisted on 19 January 1916; and at the conclusion of the war Returned to Australia, 3 July 1919. 142 Corporal James Arthur GILBERT, a 23 year old Labourer from Adaminaby, New South Wales. He enlisted on 25 January 1915; and subsequently Died of Disease, 7 July 1917. 1891 Private Horace Hugh GORDON, a 21 year old Driver from Forest Lodge, New South Wales. He enlisted on 10 January 1916; and at the conclusion of the war Returned to Australia, 2 September 1919. 1927 Private Gordon Valentine GOUGH, a 24 year old Drover from Garah via Moree, New South Wales. He enlisted on 3 February 1916; and at the conclusion of the war Returned to Australia, 20 July 1919. 312 Private Roland Leslie HARRISON, a 27 year old Station Overseer from Willows, New South Wales. He enlisted on 9 February 1915; and at the conclusion of the war Returned to Australia, 18 December 1919. 1893 Private Walter HOLLAND, a 23 year old Farmer from Cobargo, New South Wales. He enlisted on 12 January 1916; and at the conclusion of the war Returned to Australia, 8 September 1919. 1913 Private Herbert Thomas George HOWE, a 31 year old Carrier from Surrey Hills, New South Wales. He enlisted on 24 January 1916; and at the conclusion of the war Returned to Australia, 16 March 1919. 1894 Private Garnet Woolsey JARVIS, a 35 year old Labourer from The Oaks via Camden, New South Wales. He enlisted on 14 February 1916; and subsequently Returned to Australia, 12 July 1918. 1895 Private Ernest Thomas JONES, a 23 year old Labourer from St Peters, New South Wales. He enlisted on 24 January 1916; and at the conclusion of the war Returned to Australia, 24 July 1919. 1896 Private Reuben Headley JONES, a 24 year old Carter from Forest Lodge, New South Wales. He enlisted on 18 January 1916; and at the conclusion of the war Returned to Australia, 26 July 1919. 343 Private William L'ESTRANGE, a 20 year old Dairy Farmer from Fairfield, New South Wales. He enlisted on 11 February 1915; and at the conclusion of the war Returned to Australia, 5 March 1919. 1898 Private Horace George McCRAE, a 21 year old Labourer from Balmain, New South Wales. He enlisted on 31 January 1916; and at the conclusion of the war Returned to Australia, 20 July 1919. 1926 Private Norman Hilton McGINTY, a 21 year old Farmer from Bundarra, New South Wales. He enlisted on 29 June 1916; and at the conclusion of the war Returned to Australia, 25 September 1919. 1900 Private David Thomas NASH, a 22 year old Labourer from Dungog, New South Wales. He enlisted on 25 January 1916; and at the conclusion of the war Returned to Australia, 24 July 1919. 1928 Private Herbert George PERRING, a 19 year old Labourer from Nundle via Tamworth, New South Wales. He enlisted on 9 May 1916; and at the conclusion of the war Returned to Australia, 24 July 1919. 1902 Private William PINKERTON, a 19 year old Canvasser from Ashfield, New South Wales. He enlisted on 17 January 1916; and at the conclusion of the war Returned to Australia, 25 April 1919. 1929 Private Thomas Albert PLUMMER, a 28 year old Farmer from Wagga, New South Wales. He enlisted on 29 May 1916; and at the conclusion of the war Returned to Australia, 29 April 1919. 1906 Private John Michael RAE, a 43 year old Carpenter from North Sydney, New South Wales. He enlisted on 24 January 1916; and at the conclusion of the war Returned to Australia, 4 March 1919. 1907 Acting Sergeant Arthur RICHARDSON, a 32 year old bricklayer from Leichhardt, New South Wales. He enlisted on 6 December 1915; and subsequently Returned to Australia, 15 February 1918. 1908 Private Allan Marcus RIDEOUT, a 27 year old Labourer from Camden, New South Wales. He enlisted on 13 September 1915; and subsequently Returned to Australia, 12 July 1918. 1930 Private David ROWE, a 20 year old Farmer from Frederickton, New South Wales. He enlisted on 9 May 1916; and at the conclusion of the war Returned to Australia, 20 July 1919. 1909 Private Joseph William SMITH, a 25 year old Labourer from Bellingen, New South Wales. He enlisted on 24 January 1916; and subsequently was Killed in Action, 31 October 1917. 1911 Private Francis Layard TOURLE, a 29 year old Grazier from Strathfield, New South Wales. He enlisted on 17 February 1916; and at the conclusion of the war Returned to Australia, 24 July 1919. 1932 Private James Walter Ray WALSH, a 22 year old Postal clerk from Walcha, New South Wales. He enlisted on 16 May 1916; and at the conclusion of the war Returned to Australia, 20 July 1919. 1925 Private Thomas Cyril WILLIAMS, a 21 year old Farmer from Glen Innes, New South Wales. He enlisted on 25 May 1916; and at the conclusion of the war Returned to Australia, 9 July 1919. 12th Australian Light Horse Regiment, AIF, 12th Reinforcements, embarked from Sydney, New South Wales on board HMAT A58 Kabinga 12 September 1916. The HMAT A58 Kabinga weighed 4,657 tons with an average cruise speed of 12 knots or 22.22 kmph. It was owned by the Ellerman & Bucknall SS Co Ltd, London. The Kabinga was captured by Emden in the Bay of Bengal on 12 September 1914 and released with the Emden’s beaching at the Cocos Islands. The Kabinga was leased by the Commonwealth until 19 June 1917. 1941 Private Thomas John BENNETTS, a 34 year old Farmer from Narrabri, New South Wales. He enlisted on 7 February 1916; and at the conclusion of the war Returned to Australia, 9 July 1919. 1942 Private Frederick James BISGROVE, a 22 year old Station hand from Wahroonga, New South Wales. He enlisted on 7 February 1916; and at the conclusion of the war Returned to Australia, 28 January 1919. 524 Private Arthur Leslie BLACKBURN, a 20 year old Boundary Rider from Stanmore, New South Wales. He enlisted on 1 December 1914; and at the conclusion of the war Returned to Australia, 27 July 1919. 1943 Private John BRUNTON, a 27 year old Farm contractor from Merrylands, New South Wales. He enlisted on 9 March 1916; and at the conclusion of the war Returned to Australia, 8 October 1919. 1946 Private William George Ernest CURREY, a 26 year old Grazier from Coonamble, New South Wales. He enlisted on 25 January 1916; and at the conclusion of the war Returned to Australia, 24 July 1919. 1947 Private George Allan DAVIS, a 25 year old Labourer from Garah via Moree, New South Wales. He enlisted on 1 February 1916; and at the conclusion of the war Returned to Australia, 15 June 1919. 1948 Private Henry Hastings De La FORCE, a 25 year old Farmer from Kempsey, New South Wales. He enlisted on 7 February 1916; and at the conclusion of the war Returned to Australia, 26 July 1919. 1949 Private John Henry DICKSON, a 27 year old Carter from Windsor, New South Wales. He enlisted on 6 November 1915; and at the conclusion of the war Returned to Australia, 10 July 1919. 1950 Private Patrick Bede DONNELLY, a 41 year old Storeman from Wagga, New South Wales. He enlisted on 29 December 1915; and at the conclusion of the war Returned to Australia, 16 March 1919. 1951 Private Colin Campbell Brewster DOUGLAS, a 44 year old Farmer from Aldersyde Dubbo, New South Wales. He enlisted on 10 February 1916; and at the conclusion of the war Returned to Australia, 24 July 1919. 1953 Acting Corporal James FLETCHER, a 21 year old Clerk from Mosman, New South Wales. He enlisted on 1 November 1915; and at the conclusion of the war Returned to Australia, 26 December 1918. 1954 Private Thomas Cross GIBSON, a 32 year old Carpenter from St Leonards, New South Wales. He enlisted on 7 February 1916; and at the conclusion of the war Returned to Australia, 3 July 1919. 1955 Private Richard James GOGGIN, a 23 year old Tailor from Bredbo, New South Wales. He enlisted on 8 February 1916; and at the conclusion of the war Returned to Australia, 17 July 1919. 1956 Private Charles Albert GOUGH, a 23 year old Drover from Garah via Moree, New South Wales. He enlisted on 3 February 1916; and at the conclusion of the war Returned to Australia, 28 January 1919. 1958 Private James John HALL, a 22 year old Blacksmith from Redfern, New South Wales. He enlisted on 4 January 1916; and at the conclusion of the war Returned to Australia, 24 July 1919. 1975 Private Walter Thomas JACKSON, a 21 year old Farmer from Wellington, New South Wales. He enlisted on 10 February 1916; and at the conclusion of the war Returned to Australia, 24 July 1919. 1960 Private Eric Oswald LEES, a 23 year old Farmer from Naremburn North, Sydney, New South Wales. He enlisted on 6 February 1915; and at the conclusion of the war Returned to Australia, 20 July 1919. 1961 Private Alfred Andrew MARCH, a 23 year old Drover from Glen Innes, New South Wales. He enlisted on 3 February 1916; and at the conclusion of the war Returned to Australia, 17 July 1919. 478 Private Neil NICHOLSON, a 21 year old Farm Labourer from Mulwala, New South Wales. He enlisted on 20 January 1915; and at the conclusion of the war Returned to Australia, 29 April 1919. 1962 Private Christian Edward PRATT, a 19 year old Engineer from Peak Hill, New South Wales. He enlisted on 15 June 1915; and at the conclusion of the war Returned to Australia, 2 August 1919. 1963 Private Harry Hancock RATHBONE, a 22 year old Grazier from Tullamore, New South Wales. He enlisted on 8 February 1916; and subsequently was Killed in Action, 19 April 1917. 1968 Private Frank Edwin SINGLETON, a 23 year old Overseer from Nyngan, New South Wales. He enlisted on 6 September 1915; and at the conclusion of the war Returned to Australia, 4 March 1919. 1965 Private Hillas William SMITH, a 21 year old Ship Steward from Enmore, New South Wales. He enlisted on 11 January 1916; and at the conclusion of the war Returned to Australia, 3 July 1919. 1966 Private Walter James SMITH, a 22 year old Farm Labourer from Leichhardt, New South Wales. He enlisted on 17 January 1916; and at the conclusion of the war Returned to Australia, 20 July 1919. 1967 Acting Sergeant John James SULLIVAN, a 22 year old Clerk from Paddington, New South Wales. He enlisted on 31 March 1915; and at the conclusion of the war Returned to Australia, 28 January 1919. 1969 Private Percy Clifford TAYLOR, a 38 year old Labourer from Crows Nest, New South Wales. He enlisted on 19 January 1916; and subsequently Returned to Australia, 23 December 1918. 1970 Private Sydney Thomas THOMPSON, a 26 year old Farmer from Bibbenluke via Monaro, New South Wales. He enlisted on 18 January 1916; and at the conclusion of the war Returned to Australia, 18 February 1919. 21 Private Keith Charles WADE, a 21 year old Labourer from Hurstville, New South Wales. He enlisted on 28 January 1915; and subsequently Returned to Australia, 12 July 1918. 456 Private Vivian Henry WEST, a 24 year old Clerk from Rockdale, New South Wales. He enlisted on 13 February 1915; and at the conclusion of the war Returned to Australia, 18 July 1919. 1971 Private David Joseph WILLIAMS, a 19 year old Horse breaker from Captains Flat via Bungendore, New South Wales. He enlisted on 27 January 1916; and at the conclusion of the war Returned to Australia, 24 July 1919. 200 Private Thomas WILLIAMS, a 21 year old Labourer from Wellington, New Zealand. He enlisted on 6 February 1915; and at the conclusion of the war Returned to Australia, 26 July 1919. 1973 Private John Leslie YEO, a 20 year old Farmer from Dubbo, New South Wales. He enlisted on 10 February 1916; and at the conclusion of the war Returned to Australia, 24 July 1919. 1972 Private Joseph Charles YEO, a 31 year old Farmer from Dubbo, New South Wales. He enlisted on 10 February 1916; and at the conclusion of the war Returned to Australia, 28 January 1919. 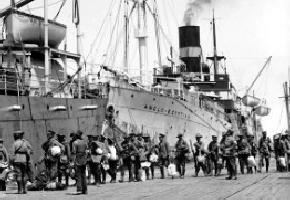 12th Australian Light Horse Regiment, AIF, 13th Reinforcements, embarked from Melbourne, Victoria on board HMAT A6 Clan Mccorquodale 19 September 1916. The HMAT A6 Clan Maccorquodale weighed 5121 tons with an average cruise speed of 15 knots or 27.78 kmph. It was owned by the Cayser, Irvin and Co., Glasgow, and leased by the Commonwealth until 14 April 1915. The Clan Maccorquodale was torpedoed and sunk in Mediterranean, 17 November 1917. 2001 Private Warren Montgomery BARNETT, a 22 year old Postmaster from Gladstone, New South Wales. He enlisted on 22 June 1916; and at the conclusion of the war Returned to Australia, 25 September 1919. 2047 Private Claude William BORTHWICK, an 18 year old Plumber from Manly, New South Wales. He enlisted on 20 January 1916; and at the conclusion of the war Returned to Australia, 3 July 1919. 280 Private Stanley BROOME, a 25 year old Station Overseer from Rockdale, New South Wales. He enlisted on 18 January 1915; and at the conclusion of the war Returned to Australia, 29 April 1919. 2002 Private Andrew BURTON, a 27 year old Bricklayer from Uralla, New South Wales. He enlisted on 18 May 1916; and at the conclusion of the war Returned to Australia, 3 July 1919. 2045 Private Frederick Archibald CAMERON, a 23 year old Labourer / Loco fireman from Ellalong via Cessnock, New South Wales. He enlisted on 23 November 1915; and subsequently Returned to Australia, 1 October 1918. 2006 Private Gordon Lachlan CAMERON, a 25 year old Farmer from Furracabad Glenn Innes, New South Wales. He enlisted on 11 April 1916; and at the conclusion of the war Returned to Australia, 24 July 1919. 2004 Private William Henry CARTER, a 20 year old Stationhand from Torryburn Station Uralla, New South Wales. He enlisted on 10 May 1916; and at the conclusion of the war Returned to Australia, 24 July 1919. 2044 Private George Walter CARTWRIGHT, a 26 year old Labourer from Goulburn, New South Wales. He enlisted on 15 January 1916; and subsequently Returned to Australia, 12 July 1918. 2005 Private William James COOPER, a 20 year old Carpenter from Uralla, New South Wales. He enlisted on 6 May 1916; and at the conclusion of the war Returned to Australia, 20 July 1919. 2038 Private John Henry CORBETT, a 21 year old Labourer from Bowling Alley Point via Tamworth, New South Wales. He enlisted on 6 May 1916; and at the conclusion of the war Returned to Australia, 15 June 1919. 2039 Private William James CORBETT, a 28 year old Labourer from Bowling Alley Point via Tamworth, New South Wales. He enlisted on 19 May 1916; and subsequently Died of Disease, 23 March 1919. 2007 Private Richard Laurence DAVEY, a 30 year old Farmer from Balmoral, New South Wales. He enlisted on 22 May 1916; and at the conclusion of the war Returned to Australia, 12 June 1919. 2009 Acting Sergeant Thomas Henry ELVIN, a 34 year old Ironmonger from Annandale, New South Wales. He enlisted on 6 December 1915; and at the conclusion of the war Returned to Australia, 29 April 1919. 2034 Private Donald Leslie GOODFELLOW, a 21 year old Wool Classer from Mittagong, New South Wales. He enlisted on 22 May 1916; and at the conclusion of the war Returned to Australia, 29 July 1919. 2035 Private Frederick GOODFELLOW, a 22 year old Wool Classer from Mittagong, New South Wales. He enlisted on 22 May 1916; and at the conclusion of the war Returned to Australia, 15 January 1919. 2031 Private James Vincent GRANT, a 21 year old Box maker from Paddington, New South Wales. He enlisted on 9 May 1916; and at the conclusion of the war Returned to Australia, 15 June 1919. 2013 Private Arthur William KNAUF, a 26 year old Farmer from Furracabad Glen Innes, New South Wales. He enlisted on 24 May 1916; and at the conclusion of the war Returned to Australia, 24 July 1919. 2014 Private Thomas LATIMER, a 30 year old Overseer from Coonamble, New South Wales. He enlisted on 20 December 1915; and at the conclusion of the war Returned to Australia, 5 March 1919. 2041 Private Robert McCANN, a 21 year old Labourer from Sydney, New South Wales. He enlisted on 20 July 1916; and at the conclusion of the war Returned to Australia, 17 July 1919. 2019 Private Oswald Hubert McLENNAN, a 20 year old Postal clerk from Uralla, New South Wales. He enlisted on 23 April 1916; and at the conclusion of the war Returned to Australia, 16 January 1919. 2037 Private John Lawrence NEWLANDS, a 41 year old Carter from Newtown, New South Wales. He enlisted on 12 May 1916; and subsequently Returned to Australia, 22 January 1917. 2043 Private David James O'ROURKE, an 18 year old Labourer from Wellington, New South Wales. He enlisted on 11 October 1915; and at the conclusion of the war Returned to Australia, 2 August 1919. 363 Private Henry Harrison PEARD, a 25 year old Labourer from Albury, New South Wales. He enlisted on 12 January 1915; and at the conclusion of the war Returned to Australia, 9 January 1920. 2021 Private James PITTMAN, a 34 year old Farmer from Kurrajong via Richmond, New South Wales. He enlisted on 23 May 1916; and at the conclusion of the war Returned to Australia, 24 July 1919. 2046 Private John POLLARD, a 22 year old Driver from Burriga, New South Wales. He enlisted on 15 January 1916; and at the conclusion of the war Returned to Australia, 27 November 1919. 2022 Private Charles Howard SHAW, a 34 year old Farmer from Gunnedah, New South Wales. He enlisted on 12 April 1916; and subsequently Returned to Australia, 12 July 1918. 2025 Private Cecil Alfred SMITH, a 23 year old Labourer from Armidale, New South Wales. He enlisted on 8 May 1916; and subsequently Returned to Australia, 12 November 1917. 2024 Private Thomas Andrew SMITH, a 21 year old Labourer from Uralla, New South Wales. He enlisted on 1 May 1916; and at the conclusion of the war Returned to Australia, 16 March 1919. 2023 Private Peter STEWART, a 43 year old Labourer from North Fitzroy, Victoria. He enlisted on 20 May 1916; and at the conclusion of the war Returned to Australia, 24 July 1919. 2036 Private Neville Keith TATE, an 18 year old Bank clerk from Macksville, New South Wales. He enlisted on 22 July 1916; and at the conclusion of the war Returned to Australia, 20 July 1919. 2042 Private Garnett Edgar THOMPSON, a 21 year old Drover from Normanhurst via Hornsby, New South Wales. He enlisted on 21 July 1916; and at the conclusion of the war Returned to Australia, 24 July 1919. 2027 Acting Corporal William John Henry VITNELL, a 25 year old Accountant from Eugowra via Orange, New South Wales. He enlisted on 1 February 1916; and at the conclusion of the war Returned to Australia, 20 July 1919. 2040 Private Thomas WILLIAMS, a 21 year old Horse driver from Bundarra, New South Wales. He enlisted on 29 June 1916; and at the conclusion of the war Returned to Australia, 18 July 1919. 12th Australian Light Horse Regiment, AIF, 18th Reinforcements, embarked from Sydney, New South Wales on board HMAT A15 Port Sydney 9 May 1917. The HMAT A15 Star of England, later renamed Port Sydney, weighed 9,136 tons with an average cruise speed of 13.5 knots or 25.00 kmph. It was owned by the Commonwealth & Dominion Line Ltd, London, and leased by the Commonwealth until 22 September 1917. 2332 Private Arthur George AUSTIN, a 25 year old Fireman from West Tamworth, New South Wales. He enlisted on 5 March 1917; and subsequently Died of Disease, 17 November 1918. 2331 Private Horace Malcolm AUSTIN, a 21 year old Labourer from West Tamworth, New South Wales. He enlisted on 19 February 1917; and at the conclusion of the war Returned to Australia, 20 July 1919. 2320 Private Noble BROOKS, a 35 year old Farmer from Bathurst, New South Wales. He enlisted on 8 February 1917; and subsequently Returned to Australia, 4 July 1917. 2302 Private Osborne CLARKE, an 18 year old Labourer from Sutton Forest, New South Wales. He enlisted on 26 February 1917; and at the conclusion of the war Returned to Australia, 20 July 1919. 2315 Private Thomas CONRICK, a 37 year old Farmer from Nyngan, New South Wales. He enlisted on 2 March 1917; and at the conclusion of the war Returned to Australia, 2 January 1919. 2314 Private William Robert John CROTTY, a 21 year old Labourer from Bedgerebong via Forbes, New South Wales. He enlisted on 12 February 1917; and at the conclusion of the war Returned to Australia, 10 July 1919. 2328 Private Ernest Read ELMS, a 34 year old Labourer from Penrose Bathurst, New South Wales. He enlisted on 12 January 1917; and at the conclusion of the war Returned to Australia, 20 July 1919. 2311 Private Benjamin Creswell GILLHAM, a 21 year old Stockman from Toowoomba, Queensland. He enlisted on 5 March 1917; and at the conclusion of the war Returned to Australia, 20 July 1919. 2310 Private James Harold GREENUP, an 18 year old Farmer from Canowindra, New South Wales. He enlisted on 21 February 1917; and at the conclusion of the war Returned to Australia, 7 April 1919. 2312 Private James GREER, a 21 year old Labourer from Sydney, New South Wales. He enlisted on 14 February 1917; and at the conclusion of the war Returned to Australia, 15 December 1919. 2308 Private Thomas GREER, a 30 year old Farmer from Sydney, New South Wales. He enlisted on 20 February 1917; and at the conclusion of the war Returned to Australia, 26 July 1919. 2333 Private Cecil George Joseph GUMMOW, a 22 year old Motor mechanic from West Melbourne, Victoria. He enlisted on 2 March 1917; and subsequently Died of Disease, 14 August 1918. 2322 Private Alfred HERON, a 34 year old Fireman from Woollahra, New South Wales. He enlisted on 28 February 1917; and at the conclusion of the war Returned to Australia, 20 July 1919. 2330 Private George Bernard HOMBSCH, a 22 year old Farmer from Oxley Tamworth, New South Wales. He enlisted on 19 February 1917; and at the conclusion of the war Returned to Australia, 15 April 1919. 2304 Private Charles HORNER, a 36 year old Labourer from Wollongong, New South Wales. He enlisted on 28 February 1917; and at the conclusion of the war Returned to Australia, 10 July 1919. 2323 Private John HORTON, a 21 year old Miner from Newcastle, New South Wales. He enlisted on 5 March 1917; and at the conclusion of the war Returned to Australia, 20 July 1919. 2309 Private George Arthur JESSE, a 40 year old Wheeler from Enfield, New South Wales. He enlisted on 5 March 1917; and at the conclusion of the war Returned to Australia, 15 March 1919. 2317 Private Thomas Lindsay KELTON, a 41 year old Labourer from Strathfield, New South Wales. He enlisted on 27 February 1917; and at the conclusion of the war Returned to Australia, 20 July 1919. 2306 Private Patrick KING, a 25 year old Carrier from Pyrmont, New South Wales. He enlisted on 21 March 1917; and at the conclusion of the war Returned to Australia, 16 March 1919. 2307 Private Hubert William LANE, a 19 year old Assistant from Mosman, New South Wales. He enlisted on 27 February 1917; and at the conclusion of the war Returned to Australia, 2 August 1919. 2319 Private Harold Jack LAUER, a 23 year old Butcher from Petersham, New South Wales. He enlisted on 24 February 1917; and at the conclusion of the war Returned to Australia, 17 July 1919. 2303 Private Edwin Garnett LEES, a 22 year old Farmer from Wyalong, New South Wales. He enlisted on 26 March 1917; and at the conclusion of the war Returned to Australia, 20 July 1919. 2305 Private Arthur Charles MARSH, a 21 year old Stockman from Nettle Creek, New South Wales. He enlisted on 7 March 1917; and at the conclusion of the war Returned to Australia, 17 July 1919. 2324 Private John William MORRIS, a 38 year old Farmer from Tomingley, New South Wales. He enlisted on 3 February 1917; and at the conclusion of the war Returned to Australia, 16 March 1919. 2327 Private William Henry Charles PEIME, a 37 year old Miner from Pipers Flat, New South Wales. He enlisted on 24 February 1917; and at the conclusion of the war Returned to Australia, 20 July 1919. 2318 Private George Thomas PHILLIPS, a 23 year old Farmer from Big Hill Marulan, New South Wales. He enlisted on 6 February 1917; and at the conclusion of the war Returned to Australia, 28 January 1919. 2321 Private James RILEY, a 32 year old Fitter from Alexandria, New South Wales. He enlisted on 2 March 1917; and at the conclusion of the war Returned to Australia, 2 January 1919. 2326 Private Herbert Lionel SAUNDERS, a 23 year old Farmer from Biniguy, New South Wales. He enlisted on 19 February 1917; and at the conclusion of the war Returned to Australia, 4 March 1919. 2313 Private Percy Frederick SILCOCK, a 32 year old Clerk from Stanmore, New South Wales. He enlisted on 6 February 1917; and at the conclusion of the war Returned to Australia, 10 July 1919. 2301 Sergeant Alfred Joseph STONE, a 22 year old Soldier / A&I staff from Redfern, New South Wales. He enlisted on 26 March 1917; and at the conclusion of the war Returned to Australia, 2 July 1919. 2316 Private Charles Leslie STONE, a 21 year old Farmer from Wagga, New South Wales. He enlisted on 14 February 1917; and subsequently Died of Disease, 29 October 1918. 2329 Private Ronald THOMPSON, a 25 year old Wheat Buyer from Coolamon, New South Wales. He enlisted on 8 February 1917; and at the conclusion of the war Returned to Australia, 1 November 1919. 2325 Private Alexander WEIR, a 33 year old Labourer from Alexandria, New South Wales. He enlisted on 3 February 1917; and at the conclusion of the war Returned to Australia, 29 April 1919. The following is a composite alphabetical roll of all members of 11th Australian Light Horse Regiment who are known to have embarked overseas during the Great War. Edwin Ashleigh Russell Reginald CONNOR. John Rupert COX aka John Rupert WALKER.